After six monumental sculptures were recently displayed in several Switzerland’s outdoor locations, an even more exciting Alexander Calder show will come to the UK, representing a neatly curated selection of jewelry pieces designed by the great artist. For the first time on this territory, Calder’s jewelry from all across the world will be brought together in a single show, accompanied by the images of some of the most notable female figures of the 20th century wearing it. The relationship between the women and the adornments that they wear is described beautifully by Louisa Guinness, whose gallery will proudly present the exhibition: “Like true vessels of Calder’s artistic manifesto, the women who wore his jewellery were some of the most forward thinking and unconventional of their time”. 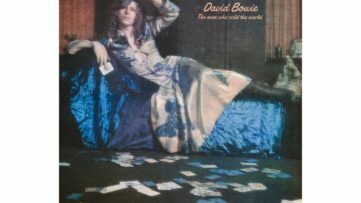 It is no wonder that these women truly include the legends of 20th century art such as the artist Georgia O’Keeffe and the art collector Peggy Guggenheim, or the notable feminist writer Simone de Beauvoir. Their approach to art and life was ahead of their own time just like Calder’s jewelry was. 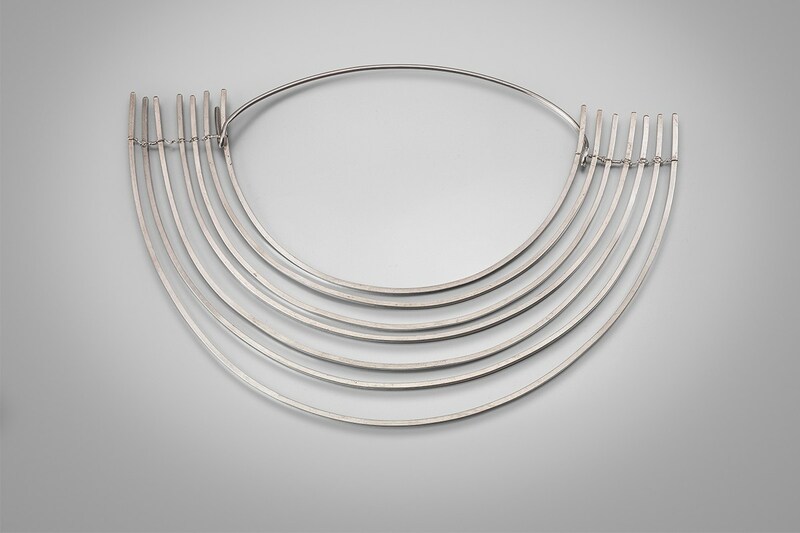 In the time of their making, in the 1930’s and the 40’s, jewelry was not yet fully informed by the aesthetics that evolved around modern art, but what Calder did was the utmost justification of the term wearable art – as that is exactly what it is. Who wouldn’t want to wear an art mobile piece? 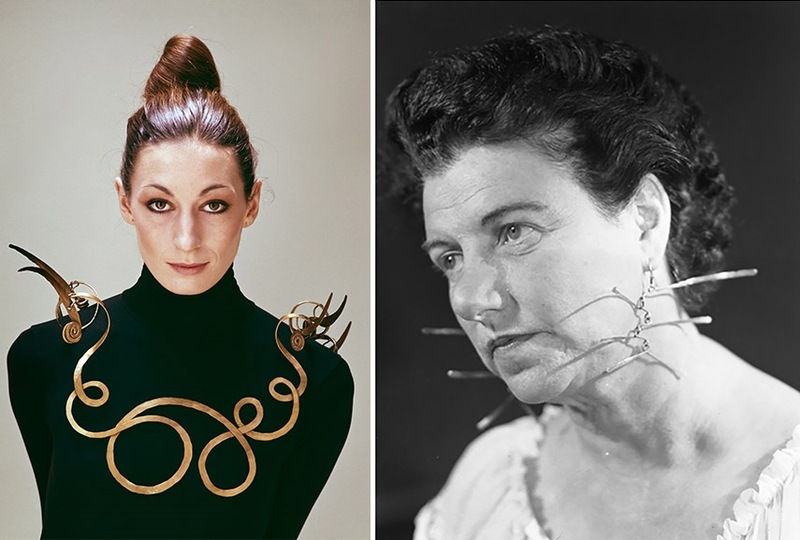 Left: Anjelica Huston wearing The Jealous Husband (c. 1940) by Alexander Calder, 1976, photo by Evelyn Hofer, ©2016 Calder Foundation, New York, Photo © Estate of Evelyn Hofer / Right: Peggy Guggenheim wearing earrings by Alexander Calder, 1942, © Solomon R. Guggenheim Foundation. Photo © Archivo Cameraphotoepoche. Credit Calder Foundation, New York – Art Resource, New York. The earrings, brooches, bracelets and necklaces were mostly made out of silver or brass wire, hammered or bent, characterized by simplicity that was rooted in his outlook on art. He approached the designs with an attentive eye, achieving an inimitable delicacy that he mastered through the making of his mobile sculptures. The sense for balance and shape seemed like an inborn ability in Calder, and made his seemingly “non-precious” jewels become sought-after by those who understood the spirit of contemporaneity and future times. 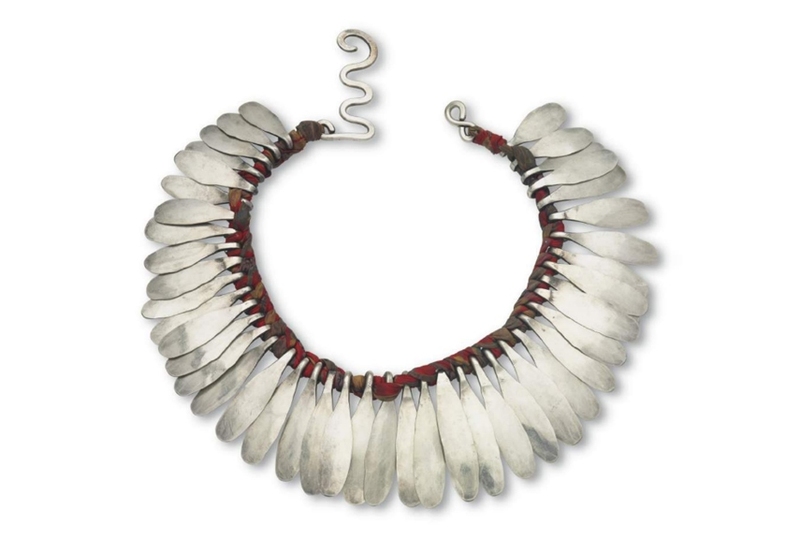 Alexander Calder – Silver and Cloth Necklace, c. 1942, silver and cloth, 40.6 x 5.7 cm, unique, courtesy the Calder Foundation and Louisa Guinness Gallery. 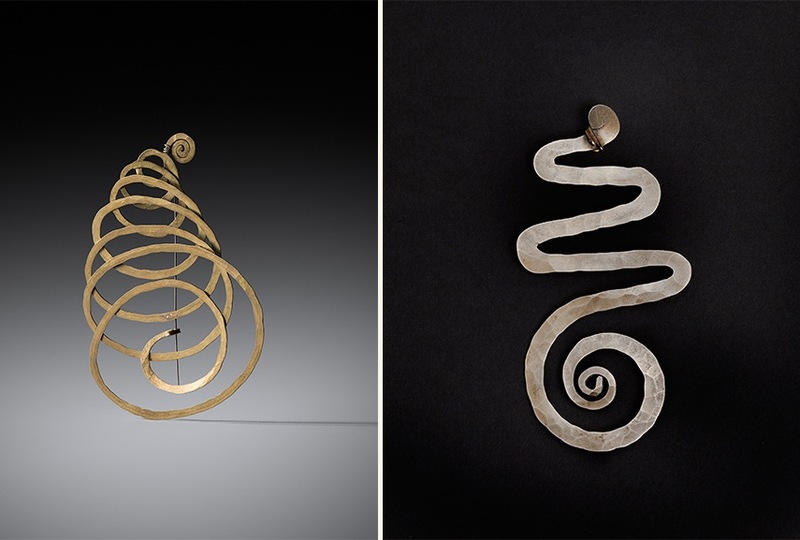 It could be said that Alexander Calder’s jewelry designs are timeless, precisely due to their unpretentious beauty that aspires to modernist universality. In addition, they were never made as parts of series or editions, since the artist enjoyed making them with his own hands, like he would have done with any other artistic genre. He approached jewelry as art, and not as mere decoration. His grandson and the president of Calder Foundation said: “Making jewellery was extremely personal for my grandfather, and he adamantly refused to edition his pieces. Each work is completely unique—just like his mobiles. 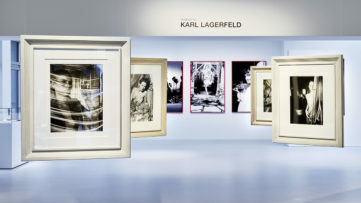 His pioneering aesthetic remains an inspiration for leagues of studio jewellers today“. The Boldness of Calder will be on view from September 27 until November 5, 2016 at Louisa Guinness Gallery. 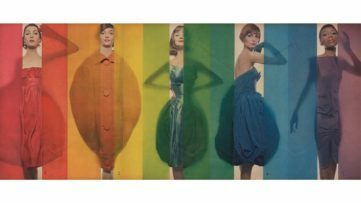 The pieces and original photographs will be accompanied by works made in collaboration with fashion designer Elise Overland and photographer Alexander English, who created a series of photographs that aim to enhance the exhibition, introducing the 20th century designs to young people in our day and age. Featured image: Alexander Calder – Untitled, c. 1940, Necklace, silver, 24.8 x 37.5cm, unique, courtesy the Calder Foundation and Louisa Guinness Gallery.